Before there was "Jersey Shore" there was.... the Jersey shore. New Jersey's famous coastline runs for miles along the Atlantic, and also remains the New York City area's unofficial summer backyard, providing welcome hot weather fun to metro-area residents. Today, ferries from midtown Manhattan whisk New Yorkers from the urban heat to the cool sands of Sandy Hook, a first stop on any complete tour of the Jersey shore. In between, you'll find white sandy beaches in state-run parks like Island Beach State Park, (photo top left) along the state's 130 mile-long Atlantic coastline. • Stretching for four miles, the Atlantic City boardwalk is the longest in the world. • This being the Garden State, three New Jersey wineries can be found along the state's Atlantic coast for summer wine tastings at Cream Ridge Winery, Four JG’s Vineyard, and Laurita Winery. • Cape May is the oldest seaside resort in the nation and has been welcoming visitors since the mid-1700's. Today, Cape May boasts the nation's second largest collection of Victorian-style homes after San Francisco. • The state seashell is the knobbed whelk (commonly called a conch shell), found on every beach in New Jersey. Asbury Park, Wildwood,Ocean City, Seaside Heights, Cape May and, of course, Atlantic City. 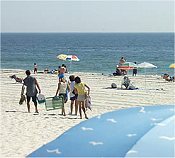 NJ Tourism - New Jersey Beaches - Check out a complete online Shore Tour with driving directions plus separate virtual tours of Tuckerton Seaport, Sandy Hook and Island Beach State Park. New Jersey Divison of Parks and Forestry - News, event calendar, online tours in iPIX, Real Media video, and photo galleries, including virtual looks at Cape May Pointe State Park, Island Beach State Park, and Barnegat Lighthouse State Park. Hopatcong State Park - With info on swimming, fishing and canoeing at the park's focal point, Lake Hopatcong ... including amenities, fees, and rules and regulations FAQ, driving directions and contact details.